The symposium, held at the school’s New Research Building on the Longwood campus, celebrated the 30th anniversary of the department. In addition to Bacow, Panelists included Peter Slavin, president of Massachusetts General Hospital, Richard G. Frank, professor of healthcare policy at the Medical School, and former Secretary of Health and Human Services Kathleen Sebelius. In the panel, Bacow discussed the importance of higher education, and especially health policy research, for the country. “These are difficult times for higher education in the United States. 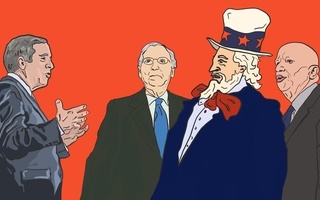 We have our critics almost everywhere you look,” Bacow said. Bacow said public skepticism towards higher education was partly derived from a perception that institutions are not doing enough for the rest of society. “Part of that criticism is based on the view that institutions like this are perhaps in the eyes of some — I don’t believe this is true — more concerned about making themselves great than they are making the world better,” he said. 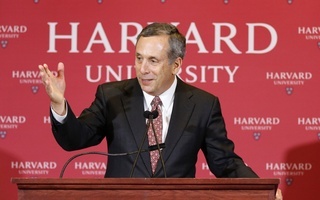 Since Bacow took office in July, he has spent significant time advocating for the public images of Harvard and higher education generally. In September, he visited his home state of Michigan in an attempt to show that Harvard can benefit economically struggling areas. This week, on a trip to San Diego, he addressed critiques that Harvard does not care about people beyond its gates. At the symposium, Bacow also attributed declining levels of public support for state universities to rising Medicaid costs. Medical School Dean George Q. Daley ’82 was unable to attend the symposium in person, but joined the conference with a recorded message praising the department’s work. “When I travel around the country, one of the things that people inevitably mention is their admiration for the department and its great work,” he said. Throughout the afternoon, professors and hospital presidents spoke about healthcare policy topics, including the individual private insurance market, Medicaid, and healthcare financing models. Later in the symposium, Sebelius discussed American healthcare policy and the future of the Affordable Care Act after the midterm elections. “The march to universal coverage, as slow, and difficult and painful as it is, will continue in the United States of America. And I’m just delighted I had a small part in that wonderful march toward equity,” she said. While we express here a positive outlook on the Bacow presidency to come, we also feel it incumbent upon us to remind him and our readers that we will scrupulously hold him accountable.